1 Blemished Available: $202.97 This item is available as a Blem/Refurb. These are items that cannot be sold as "New" merchandise and are limited to stock on hand. See the product details for a description of the product's condition. Quality/Safety - Safety was/is my number one concerns and will always win over other factors for me. First, let me say that this helmet is DOT approved/ECE certified. And I haven't crashed in it, so I can't speak to outcomes, only impressions. But I will say that I have purchased crappy bicycle helmets from Walmart that seem to have a higher build quality than the Bell Moto III. There are better options out there. I'll get to that later. First of all, the shell itself just feels cheap. Too much flex, contacts the face in all the wrong places. This is the one time where a full face helmet is probably just as effective as an open face helmet. Any (even light) contact to the face guard portion will bring it smashing directly into your jaw. Better than asphalt, I guess, but not much. Internally, the impact foam is barely covered by a thin layer of terry cloth. Cool. Retro. Really freaking uncomfortable and offers zero extra padding/protection. Did I mention thin? You might as well be wearing this helmet without the liner or using a washcloth instead. Tapping on the top/sides of the helmet with an open palm I felt like I was going to get a concussion. There is almost no impact absorption. Compare this to my Scorpion EXO R420 - I could probably survive a direct hit from a wrecking ball in that thing. Not a fair comparison with a bare-bones retro helmet, I know. But still. The whole thing just felt ridiculously cheaply made. You are definitely not getting your money's worth. Features - There are none, really. But that's not why you're buying this helmet anyway. I will say that the extra large eyeport is great for accommodating pretty much any google you would want to use. So that's something. And it's a super light helmet, which is nice. Style - This is where the Bell Moto III gets all of its points. This is the original, classic, badass retro helmet, and it looks awesome. Enough to make me hesitate about returning it for approximately…. 30 seconds. I don't think I have ever looked cooler. 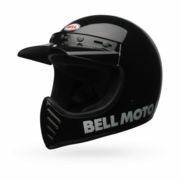 The version I ordered was the basic white version with "Bell Moto III" in black text around the face. But there are tons of awesome graphic options and they all look great. Big win here. But not worth the tradeoff in the other areas, in my opinion. Not even close. And that brings me to alternatives. I was truly sad that I couldn't justify the compromise on quality/style with the Moto III. In looking around for alternatives I came across the Nexx XG200. Very similar concept, much better execution (at a bit higher cost, but not much). I had previously tried some Nexx helmets when I attended a bike event in the UK this past winter and the fit wasn't great, so I didn't have high hopes. Ordered one anyway (medium) and the thing fits like a glove. The interior liner is MUCH higher quality (thickness, padding, materials used, even the design aesthetic - yes, the liner has a sweet design) than the Bell Moto III, as is the shell (sturdier, same weight). Much better impact absorption and all around feels like a much safer helmet. Extra features include small forehead vents. Similar awesome graphic options. Fits my Oakley goggles just fine, even with a somewhat smaller eyeport. The 3-snap design can also accommodate a huge range of other aftermarket face shields, etc., unlike the Moto III's 5-snap design. It's also DOT-approved (for what that's worth) and while it doesn't have the ECE sticker if you buy it in the US, the same helmet is ECE-certified in Europe (I called to check after seeing it listed as ECE-certified on EU websites but not on US ones). You are easily getting twice the helmet for 20% more money, in my opinion. For those of you that care about more than just how a helmet looks, hopefully this review provides a bit of a counterpoint to the other style-centric reviews for the Bell Moto III I've seen on a bunch of sites. Thanks for reading! I really enjoy wearing this helmet. So there's kind of a lot for me to say about this helmet. First off, I bought this because I'm retro trash and love that aesthetic. I'm 5'8", around 140lbs - I got the helmet in a small, and at first it gave me that bubblehead effect that smaller riders hate. If you're worried about that, get some smoked or reflective goggles to hide your eyes. That'll take care of that issue. Other than that, I've really fallen in love with this helmet. In person, it looks like a minimalist art piece or fixture. The quality is excellent and I like the interior a lot more than I thought I would. I was worried that the terry-cloth was going to be rough or course, instead it's like having a blanket as a liner - really nice and comfortable. As for riding with it. It's an open-face, so yes it takes in a lot of air and noise, but if you're like me, and really enjoy the breeze, it's excellent. I wear ear phones and listen to music while I ride, so that helps mitigate some of the noise too. Otherwise, I'd recommend ear plugs to help protect your hearing if you go on long rides or have a loud exhaust. Finally, the peak/sunvisor is surprisingly stable. I've ridden on the freeway going... fast... and it's not that big of an issue. The faster you go, the more it'll drag if you turn your head, but it hasn't really yanked me from side to side. It's more of light pulling. Overall, awesome helmet. I love it. Nice vintage style helmet that's a bit large on my intermediate oval 60cm head...would have liked better lining material. Helmet arrived as shown. Looks even better in person! Fits a bit small. For perspective, I'm a size M for a Bell Bullitt, but needed a size L for the Bell Moto-3. You get what you expect with this helmet. I'm sure there are others with better features. But if you're thinking about this one, it's very a likely a style choice more than anything else. And that's kind of the deal with bikes, isn't it!? Absolutely love this helmet!!!! It’s exactly what I wanted the style, the feel, the comfort. I have a 15 iron and it looks awesome. It’s pretty light too and doesn’t really put a strain on your neck trying to hold it up. The size chart said I was a large so I ordered a large and it fit but was tight and I knew it would give me a headache so I sent it back and got a XL and it fits just like you want it to. Just ordered goggles for it the Barstow Hudson’s and I will leave a review on them for how they fit in the helmet. I usually wear a Bell 500 open face helmet but I decided to get something with more protection for my face. The moto helmet provides an obstructive barrier but allows me to see and hear without being sealed inside a full helmet. It also looks badass! I wear size medium and this is one of the few helmets that uses a true medium shell, making the helmet lighter and fit better than most. It is expensive but the quality is worth the price. As cool as you can get! With all quries answered by Revzilla staff, Made my 1st purchase and its well trusted. Just beware ur wallet getting thinner. Lol. Price is reasonable and pretty fast! I got a fluorescent orange. And color os as loud as u can get, and its popping! Grab it while on sale! Sizing is true as i have a 64cm head , xxl suits me fine. Same feel as my custom500 , the newer series w 5shell sizing. So if custom500 suits u. Its almost identical. Sizing and head shape wise. Semi oval head for sure. - well i have a few custom500 helmets before, the rubber trims at the interior will degrade and peel and rot off over time ( its not leather, just some synthetic leather or rubber). Thus i skipped the limited edition or special edition... just buy the terry cloth version... nothing to peel. - u can use a full bubble face shield if it rains as a visor. And works wonder. And still look cool. If u need a classic full face for show. Look no futher! I'm really happy with my Bell Moto 3, I'm impressed at how lightweight it is, it's super comfortable and doesn't look huge (I have a small head and got an xs, it's a perfect fit.). The retro styling is great and highly recommend it. Feature wise, there is not much to shout about. But looks wise, it is a simply gorgeous helmet and it looks good with my Triumph Street Scrambler. A large is a snug fit for my intermediate oval head. It's a great helmet for zipping around town but I doubt I would use it for long rides. If looking good with your retro motorcycle is a priority, I highly recommend the Bell Moto III.